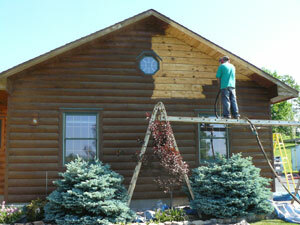 Media Blasting is an environmentally friendly process used to remove a coating or to prepare new logs for staining. 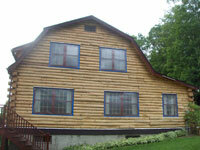 We believe corn blasting is often the best way to restore the exterior of a log home. 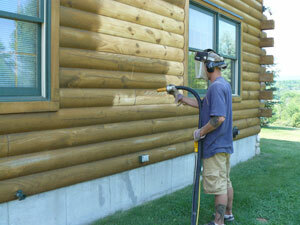 Media blasting is a unique way of removing existing coatings and dead wood fibers from exterior wood surfaces. This process is recognized in the log home industry as the best and most effective way to prepare log homes for refinishing. Media blasting machines use compressed air together with ground up corn cob. The corn cob is light and work's very effectively to strip the wood. The air pressure and the amount of media (corn cob) can be adjusted very precisely to only remove as much of the outer portion of the log as is necessary to remove the failing finish and outer wood fibers. Corn cob is bio-degradable, therefore it is not only effective but safe for the surrounding environment. 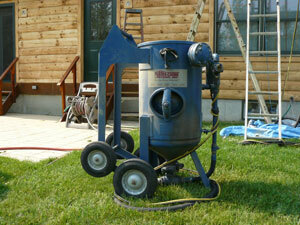 It is a dry process, therefore eliminating the problems associated with power washing. Some homes have failing caulk and chink that will allow water into the home when chemical stripping is done. Knots in the wood can also provide an avenue for water and chemicals into the home. 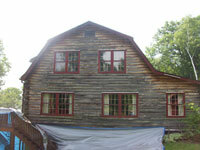 Since media blasting is a dry process, the log home can then be immediately stained without waiting for the drying process. In many parts of the country it is difficult to have more than a few consecutive dry days, when blasting you can apply the stain the same day!